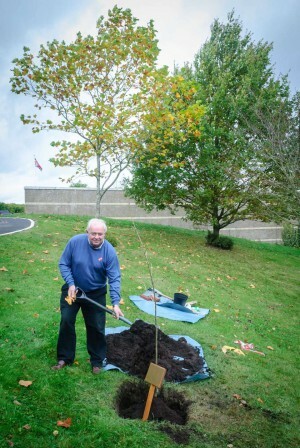 The trees planted in memory of Donald and Geoff Healey, at the Heritage Centre, Gaydon, are now well established and standing tall. 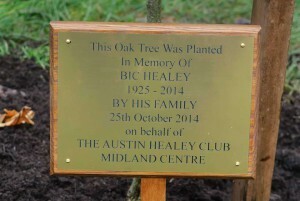 After the sad death of Bic Healey, earlier in the year, Midland Centre, who sponsored the other trees, thought that it was a fitting tribute that a tree was also planted in Bic’s name. 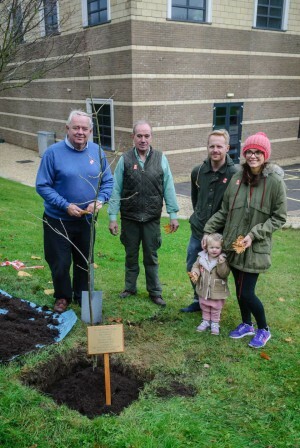 With this aim in mind it was at on Saturday 25th October, after the AGM, that members of Midlands Centre, and the Healey family gathered on the lawns outside the conference centre to plant an oak tree, chosen by Bic’s family as it was one of his favourites. 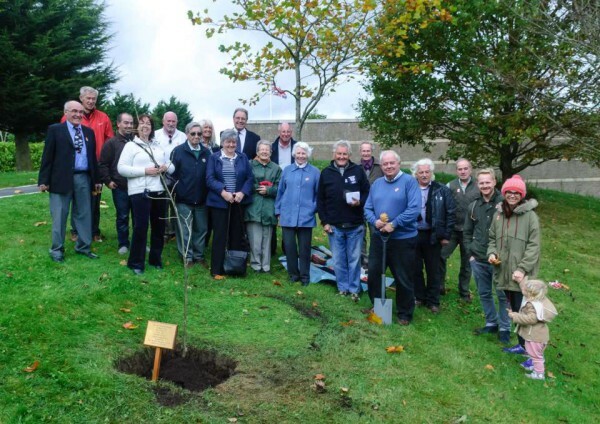 Staff at Gaydon had already dug the hole and provided the tools before members of the committee took over to do some spade work and place the tree. It was then over to Peter Healey, who spoke about his father and his life and love of the cars, before taking over the spade to finish the planting and add the plaque. Peter Healey – Welcoming everyone and passing on memories of his father before taking up the spade. 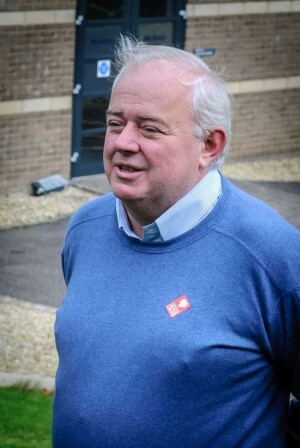 Peter was accompanied by his brother in-law, Roy, Bic’s grand-daughter, Rebecca, with her husband Stuart, and their daughter Darcey – Bic’s great-grand-daughter. It was nice to see a few other members of the club had come to support the event and that the weather was especially kind to us. When the tree had been bought it still had leaves, so Mell Ward had collected these as they fell and bought them along on the day. Peter was able to take some of the leaves back to Cornwall for Mary and Darcey seemed very keen to plant as many as possible around the tree. Hopefully she’ll be able to return one day and see not only the Healey cars remembered in the museum but also the Healey trees – a living reminder of the men who, each in their own way, played a part in creating the cars that have given us so much pleasure and friendship over the years. Knowing how much Bic loved both the cars and people, we hope he would have approved. Three generations of the Healey family attended the tree planting. In the background, the two other “Healey” trees, planted in memory of Donald and Geoff, are growing well – lets hope that Bic’s tree grows as tall. 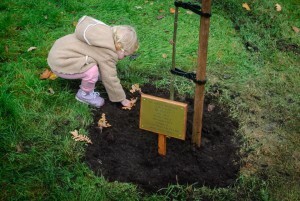 Bic’s great grand daughter, Darcey stole the show with her tree planting. Thanks to everyone who attended – the tree is there, honestly!